On behalf of the EMSA All-Star soccer game committee I would like to invite you to our 5th Annual night of exciting local soccer. Over the past four years we have been entertained by some of the most talented and amazing soccer local amateur soccer players. Although the formats of the games have changed dollar for dollar this is best local soccer in one place at one time. We have featured players from LAWSL (London area women's soccer league), MMSL (Middlesex Masters Men's league and from WOSL Western Ontario Soccer League. All three league are clearly the most dominating amateur soccer leagues in the area. We have been very blessed to have so many sponsors willing to step up and donate water, food and the fields. Hellenic, Portuguese Club and the Curinga Club have provided the venues for the event. 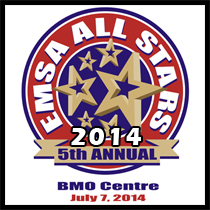 This year the event will take place at the BMO Centre London (off Rectory). BMO has graciously embraced our event. Every year we have donated all proceeds to various charities. Collectively we have raised approximately $3000.00. The MMSL is a men’s league with players 35 years of age and greater. The league is based in London with teams from Arkona to Woodstock and Tillsonburg to Exeter. The league has a very strong presence in the area running 45 teams in 5 divisions. WOSL is a men’s amateur soccer league. Highly skilled amateur level players from all over South Western Ontario participate in this league. The men’s premier division has produced the Canadian, Provincial and Provincial runner up for the last 18 years. The league has a very strong reputation in the province for having the best of the best amateur level players.